Does it matter when to use each of the two? Is there any difference in the literal translation of them? Are both of them correct when you speak and write? No, not really. "Wie viel Uhr..." sounds a little bit more formal, and hence might indicate that you want a more exact time specification, but this is just a very slight nuance. Literally translated: "How late is it?" This phrase is more common. Literally translated: "What time is it?" "Wie viel Uhr ist es?" is colloquial as opposed to "Wie spät ist es?" which is more formal. "Wie viel Uhr ist es?" is also used only in certain areas of Germany especially in the south. The meaning however is exact the same. 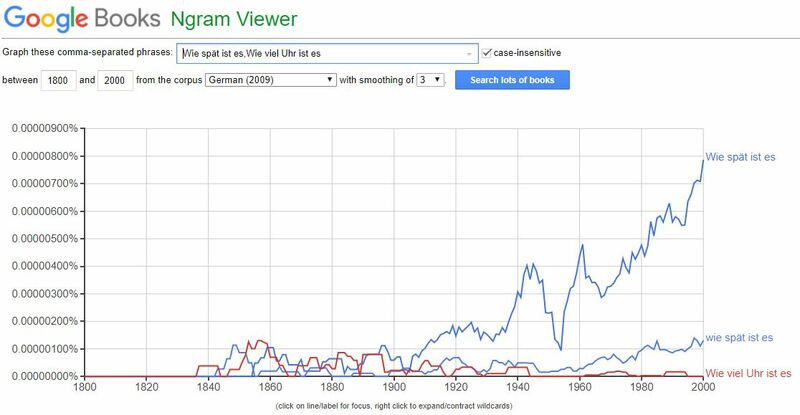 I had a look at usage and (unless I am v mistaken) "Wie viel Uhr" hardly figures in usage. I never thought it was more "formal"... but I defer on that. Not the answer you're looking for? Browse other questions tagged differences time or ask your own question. Is there any difference in the words “roast” and “fry” in German? what's the difference between wieso and warum? What is the difference between nützlich and sinnvoll?